1. Pour out the Strawberry Lemonade into another container. Pour back into container: 1 cup vodka, 1/3 cup triple sec (I use Cointreau), 1/3 cup Coconut rum (Mailibu), Cut up 4 or 5 strawberries. Refill the container with the strawberry Lemonade. 2. Be careful with this drink it definitely sneaks up on you. Don’t drink and drive. And drink with moderation. Pour out the Strawberry Lemonade into another container. 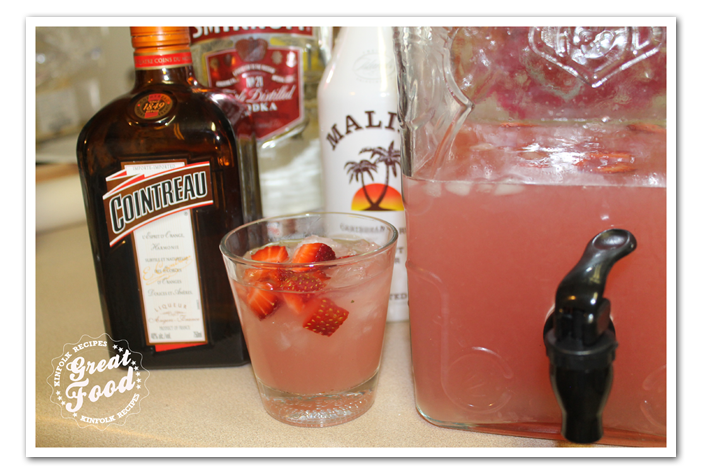 Pour back into container: 1 cup vodka, ⅓ cup triple sec (I use Cointreau), ⅓ cup Coconut rum (Mailibu), Cut up 4 or 5 strawberries. Refill the container with the strawberry Lemonade. Be careful with this drink it definitely sneaks up on you. Don't drink and drive. And drink with moderation.